A couple of nights ago we were having friends over for dinner and we were racking our brains trying to figure out what to make. One couple that was coming was vegetarian and one person we were having over was allergic to gluten, so we decided on burritos/taco salad. The guy that couldn’t have the tortillas could just make a naked burrito or have taco salad. We decided that would be the easiest, so we set off for the store. On our way we realized we had been craving Chipotle lately, so I started scouring the web for a copy-cat Chipotle rice recipe. I stumbled on this recipe from Skinny Taste that seemed simple enough, so we picked up the ingredients we needed and put everything together at home. This meal –complete with two kinds of beans, optional chicken or steak, cheese, sour cream, salsa, homemade guacamole, tomatoes, and lettuce, and sauteed peppers & onions– took around an hour and a half to prepare. The Cilantro Lime Rice really hit the spot! Add rice, water, 1 tsp oil and salt to a small pot and bring it all to a boil. Turn down to low and cook until the water evaporates for about 15 mins. It should look fairly dry throughout. Turn off the heat and keep the pot covered for an additional 5 minutes. In a medium bowl, combine chopped cilantro, lime juice, rice and remaining oil and toss until completely mixed. 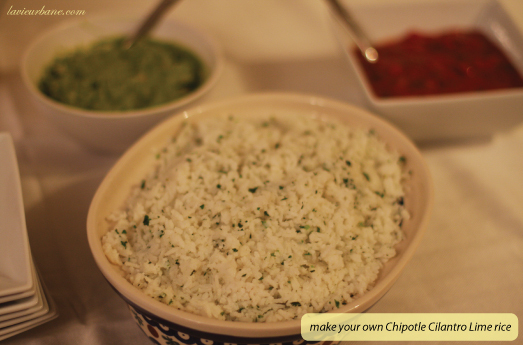 Then spoon the rice onto your tortilla, top with your favorite burrito toppings, and enjoy!